Electronic cigarettes are becoming widely popular as an alternative to traditional cigarette smoking. One of the main considerations when smoking an electronic cigarette is what type of cartridge to use. The cartridges for an electronic cigarette can either be disposed of or replaced, or they can be refilled with new liquid and reused. Using a disposable electronic cigarette cartridge is much more convenient than refilling the unit with liquid. Once a cartridge has been emptied, it is unscrewed from the battery and discarded, and a new cartridge is screwed in. Switching cartridges only takes a few seconds and provides a simple and reliable smoking experience. Although easy, ordering disposable refill cartridges tends to be more expensive. 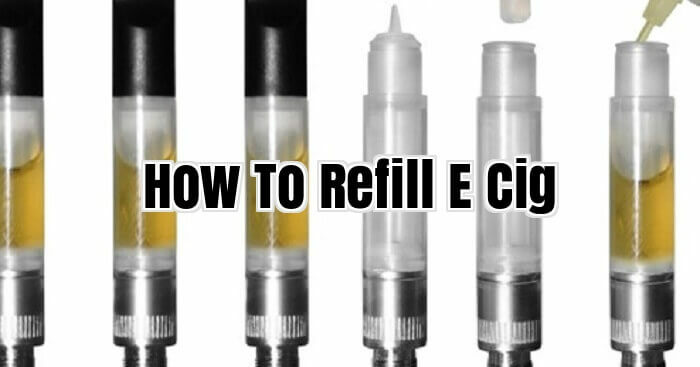 The other option available for electronic cigarette users is to refill the cartridge with liquid. Liquid is purchased separately and added to the cartridge when it is empty. There are several benefits to refilling cartridges, as it is less expensive and offers a wider variety of options. Using this method, a smoker can try different flavours and strengths of liquid from other brands while still using their preferred electronic cigarette. However, it is important to take care when refilling a cartridge so that the liquid is not spilled or leaking. Using readymade refill cartridges is an ideal solution for fast changes, and offers a reliable option for those who prefer to regularly use a new cartridge. Refilling cartridges at home provides more choices for the smoker and tends to be more affordable. The cartridge which contains the liquid nicotine can last for as long as 40 regular cigarettes and with replacements costing around $5 each, it works out a lot cheaper than regular smoking too. However, since there is no way to know that you’ve smoked one cigarettes worth, many people tend to use the electronic cigarette to smoke more than they should. To keep the costs down even further, it is possible to refill the liquid in the used cartridges much like some people refill the ink in their printer cartridges. The nicotine cartridge is filled with a special liquid which vaporizes when it is heated. Some brands allow you to buy wholesale bottles of the liquid to let you refill the cartridges by yourself. Needless to say, the process is tricky, time consuming and not for the impatient. However, it will reduce your costs if you are regularly using the electronic cigarette. There are two methods you can use; one involves dripping the liquid in to the cartridge in a steady, controlled manner using an eye-dropper. The other involves using a syringe and needle and literally injecting the liquid in to the cartridge. Most cartridges can be opened by unscrewing the top. Once opened, you will find that the inside contains a polyester filling. This needs to be removed, and then using the dropper carefully adds a few drops. Do not fill up the cartridge as the polyester filling needs to be put back in once the initial drops are added. Allow the filling to soak up the few drops, which may take several minutes. Once this is done, continue with a cycle of adding a few more drops and letting the filling soak up the liquid. The cartridge is full when no more liquid is soaked up by the polyester filling. This process can easily take 20 minutes per cartridge so you need steady hands as well as have infinite amounts of patience! The injection method is a little bit simpler but does require a needle and syringe. In this method you need to keep the filling intact, instead, push the needle all the way to the bottom of the cartridge and slowly start injecting the liquid, keeping consistent pressure on the syringe plunger. The needle must be sharp and small enough to reach the bottom of the cartridge. This method is quicker and easier than the droplet method above, but it does cause some damage to the polyester filter over time. After you’ve had some experience with electronic cigarettes, you may be ready to purchase some nicotine solution separately in order to try manually refilling your own cartridges. If you’re not interested in doing this, most brands have prefilled cartridges you can purchase that are still significantly cheaper than traditional cigarettes, so it’s really up to you. If you don’t mind doing it manually, here’s a little how-to that will walk you through the process. First you have to remove the existing cartridge from your electronic cigarette. You probably assembled the thing when you first got it, so just slide the cartridge off the device just the same as you slid it on. Inside the cartridge you’ll notice some sort of fabric filler, this stuff acts like a sponge to keep the liquid inside the cartridge as well as a bit of a wick to deliver the liquid to the atomizer. When you remove the cartridge, make sure you don’t lose that little filler material as it sometimes has a tendency to fall out. Once you’ve removed the cartridge, take your e-liquid dropper and drop four to five drops inside of the open end of the cartridge and onto the fabric filler. If you don’t have any e-liquid to refill the cartridges with, you can purchase the stuff from any number of different retailers. After you’ve filled the cartridge, just slide the thing back onto the e-cig and take a drag. You should get pretty good vapour production quickly; however, it sometimes takes a few drags to get the liquid pulled into the atomizer properly. If you take a drag and end up with some of the liquid in your mouth, it’s not the end of the world, although it tastes pretty bad. If that happens, just pull the cartridge off and stick a piece of paper towel down in there to sop up some of the excess liquid. Then replace the cartridge and try it again.